A little donkey named Bo (voice of Steven Yeun) is tired of his life at the village mill. He dreams of giving up his backbreaking daily routine and going on an adventure of his dreams. He finally works up the courage to leave and meets a lovable sheep named Ruth (voice of Aidy Bryant) and a dove named Dave (voice of Keegan-Michael Key). 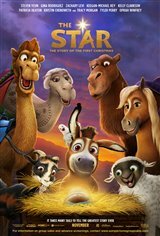 On their journey, they meet three hilarious camels and inadvertently become heroes to a young couple named Mary (voice of Gina Rodriguez) and Joseph (voice of Zachary Levi), who are expecting their first child.